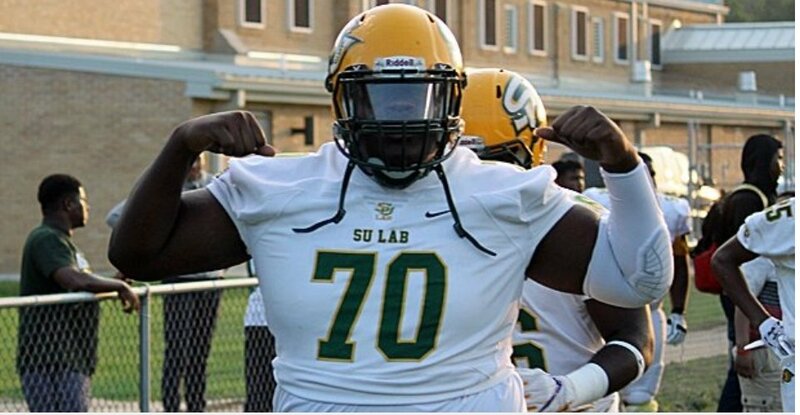 Kardell Thomas is a highly ranked prospect from Baton Rouge, La. who’s been committed to LSU since the summer of 2016. That being said, he’s always shown interest in USC. The 6-foot-3, 360-pound offensive lineman always maintained USC was a top option for him, ever since former Trojan line coach Neil Callaway offered him a scholarship back in May. Since then, Thomas said he would take an official visit to experience what the Trojans have to offer. Thomas made good on that promise this past weekend and the visit clearly impressed the budding football star. Outside of LSU and USC, Florida State, Georgia, Penn State, Oklahoma and Miami are also in contention for the product of Southern Lab HS. That being said, it would be considered a shock if he flipped from LSU.